John Pollock's live report on the ROH & NJPW G1 Supercard from Madison Square Garden with Kazuchika Okada vs. Jay White for the IWGP title. 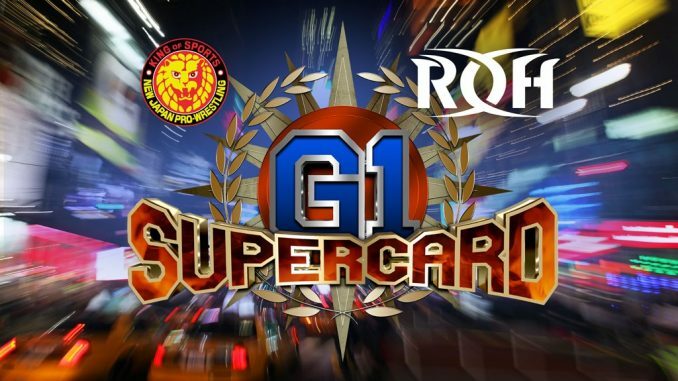 Welcome to our live coverage of the ROH and New Japan G1 Supercard from Madison Square Garden. The pre-show kicked off at 6:15 pm with a six-woman tag involving talent from Ring of Honor and Stardom. He received a huge reaction. Fale eliminated Roppongi 3K together. He tried to dump out Cheeseburger, but he was caught and returned to the ring. Ishii was not announced ahead of time. All the key New Japan stars are receiving enormous reactions and it’s clear they are the big stars to the audience. Yano came out and gave up his spot to Colt Cabana and replaced him on commentary. The entire arena chanted “Colt Cabana” was the most over of the ROH stars, so far. Haku is on the short list of talent on tonight’s show that has previously worked the building. Haku applied the Tongan Death Grip onto Cabana, who waved in Yano for assistance. The arena exploded for the surprise entrant, biggest pop of the match. Yano missed Suzuki with the turnbuckle padding, nailed Cabana and Suzuki tossed both out. It’s down to Liger, Muta, Marseglia, and O’Ryan. Liger eliminated Marseglia with a shotei and Muta eliminated O’Ryan leaving the two legends in the ring. King took the mist from Muta and was dispatched afterward. Liger stood in the ring as they chanted “Thank you, Liger”. The match never dragged despite the time and got over tremendously well to the audience. Lethal Injection was hit to Scurll after Taven was dropped onto two ladders crisscrossing. The ladders were joined and formed an “X”, Lethal dumped the contraption to the floor and it appeared to hit a fan in the front row. Officials checked on him and he appeared to be okay and remained in his seat. Taven introduced a large purple ladder as Scurll and Lethal fought on the regular sized one in the ring. Lethal and Scurll were dropped onto ladders attached to the purple one. Taven climbed with Lethal on the purple one. Taven hit Lethal with the title and he fell onto the ladder back first. Taven grabbed the title and won the match.